Silver Arrow Knits! : Tuesday Update! I cannot believe the weather here in PA! It is still warm out. I am just wearing a sweatshirt when I go out to deal with the air conditioning at the stores. I guess my knitting is keeping winter at bay. :) I must admit that I am a bit concerned that this means winter is going to be colder and longer than usual; however, I can't do anything about it. I just need to keep knitting scarves, hats, socks, and mittens! I am STILL working on the Chroma Stripped Scarf. It is never ending. The balls are getting smaller, but the scarf doesn't seem to be getting any longer. 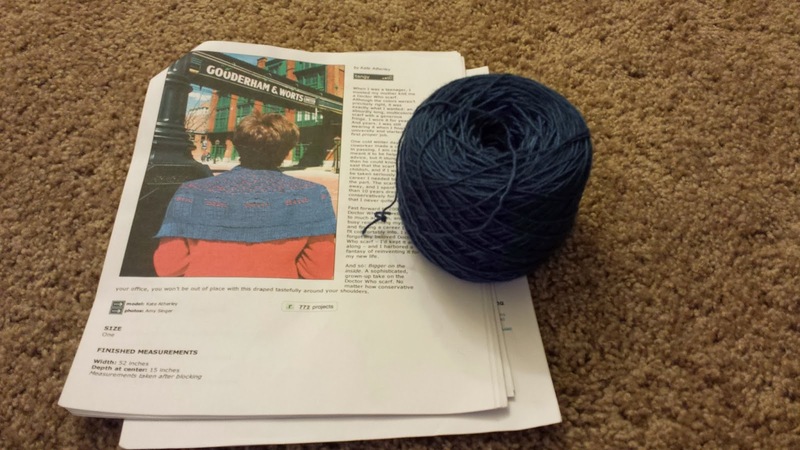 I know when I get to the end, the scarf will suddenly grow but this in-between time is awful. I think this is how things work, right? Items look like they aren't getting any bigger and then one day they are magically huge, right? Please be right. 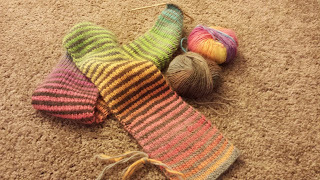 I could have sworn that I only used two balls for my other Chroma Stripped Scarf. I decided that I am going to start the Bigger on the Inside shawl from Knitty. This is a much smaller shawl than I usually knit, so I think I might actually finish it! Let me tell you, winding this yarn was a bit of an adventure with my kitty. She wanted to attack all of the yarn. I was so scared that she was going to bite through the yarn, but luckily no yarn was harmed in the winding process.